Picked this game up yesterday with gift cards. I’m about an hour in, and I’m loving it. I’m so glad to see a big-budget, major-release JRPG with a turn-based battle system. And from what the GameStop clerk told me, it’s selling extremely well at launch. Anyone else pick it up? Got any thoughts? I started with H’aanit and went south to pick up Therion. Happy with my choices. Started with Tressa and have 5/8 of the cast now. So far I'm loving it except for Sir Berg, who is insufferable. Although I will say that it's really disappointing that the characters have basically zero interaction. I'm not expecting unique scenes for every one of the ~150 possible character combinations, but plenty of other RPGs from smaller publishers have at least managed to give the other characters a generic set of lines to pick from. I hope it gets better with second chapters, but some of the reviews I've skimmed made it sound like 8 almost entirely unconnected stories. Last edited by I am nobody on Sun Jul 15, 2018 9:41 am, edited 1 time in total. Just waiting until Monday for my copy. I should probably stop preordering from Best Buy online. I want this game sooooo bad. I'm glad to see it's every bit as good as anticipated. I'm very intrigued but probably gonna wait till it's $10-20 cheaper at Black Friday or something until I buy it. I’ve heard that there are some banter options later in the game, but I haven’t gotten to them yet. I’m a little disappointed with the lack of interaction, but right now I’m so enamored with the battle system and the individuals that it’s not bothering me too much. Got all 8 now. I've settled on Tressa/Ophilia/Primrose/Cyrus as my party. I don't get a choice about Tressa, but that's okay since I gave her all the seeds in the game and she's basically unkillable now. Ophilia and Cyrus seem kind of obligatory since no one else fills the white/black mage role, and Primrose is just there because I hate Sir Berg and couldn't be bothered to level up someone else. She's alright. I like what I've seen of all the characters except the aforementioned Sir Berg, whose character is comically inconsistent, and H'aanit, because her fake medieval English annoys me and makes no sense in the context of everyone else. Banter comes in when you reach a character's second chapter and seems to be one-on-one skits kind of in the vein of the Tales series. They're better than nothing, but still not a replacement for actually showing characters interact. Also, it's really dumb that first chapter recommended levels stop increasing when they hit 12 but the lowest recommended level for second chapters is 21. Even after using basically the same party for all 8 intros, never skipping a battle, and going out of my way to get almost all the treasure chests, my party was only 17/16/16/15 on reaching a second chapter town. ^Looks like a good party. I think Alfyn could be another healer if one doesn’t want to run Ophilia, and Primrose is sort of a black mage/support if one doesn’t want to run Cyrus. I have 7/8 characters, and so far I like Primrose’s story the most. I also really like Therion, Cyrus, and H’aanit (who is my primary). If I end up choosing a party of 4, that would probably be it, despite not having a healer. However, right now I think I’m going to try to do as many of the different stories as I have stamina for. I’m going to go in level-difficulty order until I can progress H’aanit some more (whose story continues at level 27, which I’m a ways away from). For the record, I agree that Olberic is extremely lame, but I’ll disagree about H’aanit’s language. It’s a little silly, but at least it’s consistent with everyone else in her village, and also they took a lot of care to actually conjugate all the verbs correctly. As a grammar nerd I’ve been enjoying it. Yeah this is definitely a game that I want. The artwork really caught my eye. His blade is literally unbendable dude. It's probably made out of Olbericium or something. Seriously though, dude hits like a truck. 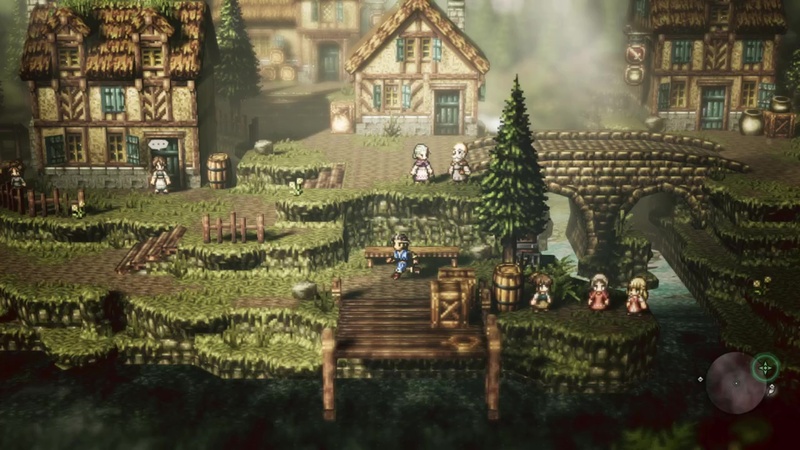 H'aanit is crazy versatile from what I've seen though. Funnily enough I managed to kill like two Caits (cat-looking Metal Slime-like enemies) and became grossly overleveled before I even got 5/8. I'm hovering in the early 20s and still have two characters to recruit. Unfortunately this means most random battles aren't worth the time they take, lol. I mostly hate Olberic because of how lazy his writing is. The world weary betrayed ex-knight is a lazy enough archetype on its own, but they didn't even put enough thought into him to realize how ridiculous it is for that character to be shouting "the battle is truly joy!" every 5 seconds. ^^H'aanit is insanely strong as well. Arrow Rain hits every enemy 5-8 times, albeit being slightly inaccurate and high SP cost. But...man, that just obliterates mobs. I've encountered few normal enemies that can survive one 4-attack burst from her. Especially when she gets a Lion Dance from Primrose, it's just game over. For the bad guys. ^I'm with you, Ian. Olberic's story is on the absolute bottom end of my priority list. Always found it interesting that when a game sells well it will make even more people buy it. It's almost like a slippery slope. The best gaming marketing is word of mouth! I'm thinking about putting my order in on Amazon as we speak. Otherwise, I wouldn't have noticed this release. ^Glad you’re picking it up! I think you’ll enjoy it. Guys, this game is not messing around when you get to the second tier of quests. Woof. Yeah, I did Tressa's second boss battle last night while somewhat underlevelled and it took me something like 45 minutes. Only beat it because of her aforementioned immortality - the rest of my party wiped three times. Hell of a satisfying ending to that fight, though. I began Therion's second chapter but i was underleveled to the point that the chances of stealing needed items was really low. I chose to put that on the backburner and instead explore a lot and that's given me a lot of EXP for all eight characters. Game is certainly true to its name!